Collecting Corn: Why do Latin American Countries have more varieties of corn than the United States? To many, the topic of plant varieties holds little interest. However, in countries like Mexico, the many different types of corn cultivated in the past are deeply ingrained in the culture, history, and traditions today. Corn originated in Mexico, and the beginnings of its cultivation nearly 9,000 years ago completely changed the way people eat1. Civilizations like the Maya, Olmec, Aztec, and Inca all have gods and legends that involve corn. Even today, groups like the Maya still value corn and associate the plant with life. Mexico has 59 varieties of indigenous corn, and Peru has 55 varieties, In contrast, the United States grows under 10 varieties, the most common of which by far is yellow corn. In Peru and Mexico, one can find corn of all different shapes, sizes, and colors, including purple, white, and blue. Why do Latin American countries like Peru and Mexico have so many varieties of corn compared to the United States? The beautiful varieties of corn in these countries are being threatened by one of the leading seed companies, Monsanto, which specializes in genetically modified organisms (GMO) in agriculture. In September 2016, Bayer, the German pharmaceutical rival company, bought Monsanto for more than $66 billion dollars3. Monsanto has been known for using harsh pesticides and spreading and selling their seeds to many farmers. Ninety percent of the corn in the United States is grown from Monsanto’s genetically modified seeds4, U.S. organic corn even has traces of GMO in its DNA. Mexico imports U.S. yellow corn, resulting in the United States dominating Mexico’s yellow corn market. In 2003, scientists from UC Berkley found DNA of GM corn traces in the local crops5. However, governments in Mexico, Peru, Ecuador, and Costa Rica have rejected the use of GMO and requests from Monsanto to plant their seeds in these countries. While some countries in Latin America are against using GMO products, other countries like Brazil, Argentina, and Paraguay have more than 120 million acres of genetically modified crops, most of which are soybean and corn crops5. There are many known consequences of the use of GMOs, like increased resistance of insects and weeds to pesticides used with GMO crops, the creation of hard to control weedy crops, and the unintentional killing of beneficial insects and non-target species4. Ninety-four percent of our seed diversity has disappeared6--that percentage is expected to continue growing with the ongoing use of harmful chemicals and homogenous crop use, negatively affecting the world’s environment and the identity and pride of cultures. 1. Novak, Sarah. (2012, January 21). 6,000 Year Old Peruvian Popcorn Reminds Us How New GMO Corn Really Is. Retrieved November 16, 2016. 2. O’Leary,, Matthew. (2016, May 20). Maize: From Mexico to the world. Retrieved November 16, 2016. 3. Mullen, J., & Riley, C. (2016, September 14). Bayer is buying Monsanto in $66 billion deal. Retrieved November 16, 2016. 4. Chow, Lorraine. (2016, January 15). 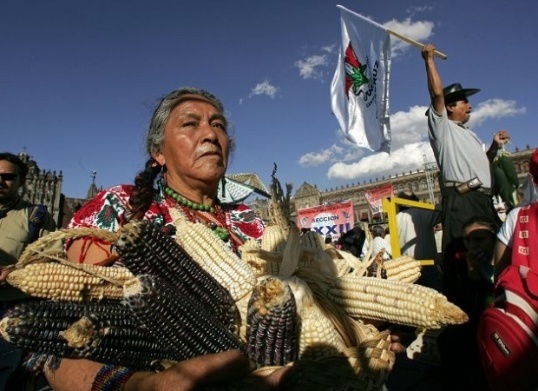 59 Indigenous Corn Varieties at Risk as Monsanto Eyes Mexico. Retrieved November 16, 2016. 5. Tegel, Simeon. (2013, January 3). In Latin America, a growing backlash against genetically modified food. Retrieved November 16, 2016. Emily Hwang is a senior undergraduate student at the University of Pittsburgh majoring in Anthropology, minoring in Economics, and getting a certificate in Latin American Studies. She is passionate about social justice and change, international development, and the culture of the world around us.